Typically, bass players are a diffident sort. Except for the occasional bass solo bone, tossed to them by ensemble leaders with more chording capability, bass players are content in fulfilling their central role in providing low notes and rhythmic groove, a supportive foundation for the unabashed bravado of lead players. Gunnar Biggs is a typical bass player. Even though in high school he studied with a bassist/educator not unfamiliar with the soloist spotlight, the great Bertram Turetzky. In late summer of 2008, Turetzky called Gunnar seeking permission to use one of his compositions, heard on David Borgo’s record, Initial Conditions. 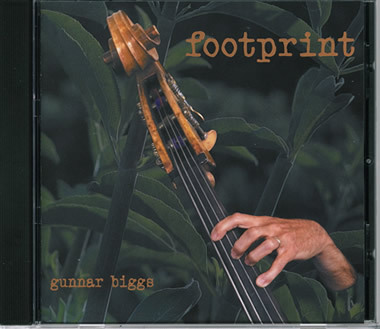 Not only was Gunnar honored by the request, he was stunned when Bert urged him to make a CD of his own work — suggesting he needed to leave a “footprint” — and so, the seeds for the CD, “footprint”, were planted. 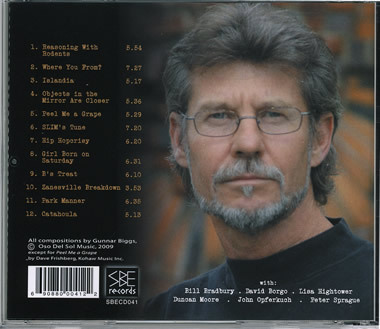 The resulting CD features some of Gunnar’s favorite local fellow musicians and his own compositions, written over the span of some twenty-seven years. He enlisted the magical engineering skills of his friend and musical colleague, Peter Sprague, and recorded the entire CD at Spragueland Studio over four days in late January and early February of 2009. Is he happy he did this? Typical bass player response is — he had fun playing with his chums, was somewhat uncomfortable assuming the “leader” role required of him in the studio, but he learned a lot. Additional typical bass player response: “any mistakes are mine” — we hope you enjoy the music. A CD release party, featuring all the performers on the CD, will take place on Friday, May 1 at 7:30 p.m — at the New Village Arts Theatre, 2787 B State Street, Carlsbad, California. Tickets: $10, no reservations, come early.